The Mailbox Says It's Spring Planning Season! Tempting, Oh So Tempting. . . The seed catalogs are already piling up! Last Thursday I, along with zillions of other Americans, consciously thought about the many things I'm thankful for. When it comes to the garden, I am of course thankful for the glorious, year-round bounty my endless toiling it provides me: all the amazingly flavorful (and beautiful!) lettuce and spinach and peppers and tomatoes and potatoes and turnips and cucumbers and beans and greens and beets and kale and Swiss chard and arugula and garlic and herbs and flowers and especially the broccoli that I only very rarely manage to successfully grow. But I'm even more thankful for something else from the garden, and it isn't even edible: it's the annual ability to completely forget every single disaster and disappointment of the year and start excitedly planning next spring's garden before winter has even begun. The seed companies know all too well that we gardeners come down with this strange, yet oh-so-convenient affliction. In fact they bank on it. Yes, just moments after the most pitiful tomato harvest in a decade has faded to a hazy memory, the seed catalogs quietly begin to arrive. Next year will be different, we tell ourselves as we begin casually flipping through the first one, eyes glazing over, brain whirring a million miles an hour as we mentally (and effortlessly!) expand the garden to ten times its current size and fill non-existent pantry shelves with 3,000 jars of neatly preserved bounty. Next year there will be no squash bugs! Next year the blister beetles will spend the summer somewhere else! Next year there will be more tomatoes than I know what to do with! Next year it will be 62 degrees and partly cloudy for 199 days in a row! Next year absolutely everything in the garden will be picture perfect! Oh, how happy the seed companies will be when they see our largest, most ambitious orders yet! We can't help it. And really, why should we? For just a few dollars (okay, for some of us it's more than just a few), our seed orders buy us endless winter hours spent happily planting and plotting and harvesting more than we could ever possibly eat. In our dream gardens there exists nothing but pure, unbugbitten success. Sometimes I think December and January are actually the most productive months in my garden. You may have noticed that these are 2007 seed catalogs in the photo. That's because I'd planned to write this post a year ago. I guess I got carried away drooling over poring through them all instead. I was so proud of myself when I faxed in a seed order on New Year's Eve--the earliest I'd ever placed one. I figured it was a sign of things to come--this would be the year I did everything on time, or even early! Instead I found myself frantically behind in more ways than I ever thought possible from January through September, even for me. I actually bought tomato plants. But that's all over now. And there's nothing but a whole new gardening year ahead. There are certain varieties of seeds I faithfully order year in and year out, and of course I save lots of my own seeds, too. But I always like to grow a certain number of new things each year as well. I'm especially drawn to old and rare heirlooms, which my beloved Baker Creek Heirloom Seeds here in Missouri specializes in. Their 2008 catalog hasn't arrived yet, but the one from my other tried and true supplier, Pinetree Garden Seeds in Maine, has. I hope to write about some of my favorite varieties of veggies in the upcoming weeks, along with some of the ones that won't be making second appearances in my garden. In the meantime, what are your favorites and--perhaps more importantly--your least favorites? Or are you buried under a pile of seed catalogs? Copyright © 2007 FarmgirlFare.com, the award-winning blog where Farmgirl Susan shares stories & photos of her crazy country life on 240 remote acres. November 2011 update: I share a great new way we enjoy Swiss chard in Wondering What To Do with Swiss Chard? Favorite Recipes and Ways to Use My Favorite Garden Vegetable. Hint: we love our powerful little $50 Waring juicer! The best Swiss chard you'll ever eat is that which you grow yourself. Find out how easy it is in my post, How To Grow Your Own Swiss Chard from Seed & Why You Should. While there are endless things you can do in the kitchen with Swiss chard, I have to admit that every year the vast majority of what I grow gets harvested very young and tossed straight into the salad bowl. But of course I eat a lot more salad than normal people. The flavorful baby leaves are a wonderful stand-in for spinach and can be happily combined with just about any other salad green you can think of. When I'm lucky, I have more Swiss chard in the garden than even I can eat in salad form. This happened early last spring when two dozen overwintered plants in the greenhouse came back to life with a vengeance. One of the things I love about Swiss chard is how amazingly big the leaves can get, but when I step inside the greenhouse and feel as if I've suddenly been transported to Jurassic Park, it starts to get a little scary. That's when it's time to whack them down and hit them with some heat, because even the most enormous leaves will shrink down to practically nothing if you cook them. It never ceases to amaze me that a bowl of bounty nearly too big to get through the door will fit inside a teacup once you cook it. The concentrated amount of nutrients that must be contained in that teacup is mind-boggling. You'll find bunches of Swiss chard in supermarkets year-round, but freshness and quality can vary greatly. Peak season in most areas is from June through October, though in milder climates you often can find interesting varieties of just-harvested bounty at farmers' markets from early spring until late fall or even early winter. Look for crisp stalks with shiny, unblemished leaves. Wondering what to do with your Swiss chard? You can't go wrong if you sauté it with chopped fresh garlic in some nice olive oil. And by all means, don't forget the stalks. I chop them up and cook them in the oil until they're soft, then add the coarsely chopped leaves, covering the pan for the first minute or two. You can add a smidgen of anchovy paste to the oil to coax out flavor (it won't add a fishy taste). Throw in a handful of chopped pancetta or proscuitto, and you'll probably receive a round of applause. A sprinkling of freshly grated Pecorino Romano might be considered over the top, but only by people who haven't yet tried it. You can use Swiss chard (and many other greens) in place of spinach in virtually any recipe. Try it in lasagna, ravioli and quiche — or even your favorite stuffing. Toss it with pasta or add thin strips to stir-fried rice during the last few minutes of cooking. Mix chopped fresh chard or kale into pizza sauce or scatter over homemade pizza before adding the cheese. Stir sliced leaves into soups, and slip steamed greens into scrambled eggs, omelets and frittatas. You can even steam Swiss chard stalks and eat them like asparagus. Need more inspiration? You'll find all sorts of other scrumptious ideas in the comments section of this post. Many thanks to all the In My Kitchen Garden readers who responded to my request to share their favorite ways to eat Swiss chard. And you'll find links to more of my Swiss chard recipes at the bottom of this post. Do you have a favorite Swiss chard recipe you'd like to share? One of my favorite ways to enjoy Swiss chard is in this dip I created last spring. This addictive stuff goes well with practically anything: crackers, tortilla chips, toasted or untoasted sourdough baguette slices, fresh veggies, pita chips, even pretzels. Don't be afraid to think beyond the dip bowl, either—try putting it on baked potatoes or using it in an omelet. I even like it cold. My version of the popular spinach artichoke dip is cooked on the stovetop instead of in the oven and uses chopped fresh Swiss chard leaves and stalks in place of frozen spinach, along with plenty of onion and garlic for extra flavor. It tastes even better if you make it a day ahead and reheat it just before serving, either in the microwave or on the stovetop (you might need to add a splash of milk when reheating on the stove). You can use reduced-fat cream cheese and mayonnaise, as well as low-fat sour cream, if desired. When I was creating the recipe, I used red Swiss chard for the initial batch, thinking the chopped stems would add nice bits of color. Instead I ended up with pink dip. It tasted great but looked like salmon spread, which might be confusing to eaters. If you're making it for yourself, go ahead and use whatever color chard you like. Heat the olive oil in a large pot. Add onion and chopped Swiss chard stalks and cook, stirring frequently, until soft, about 5 to 7 minutes. Add garlic and cook, stirring frequently, 2 minutes; do not let garlic brown. Stir cream cheese, sour cream, mayonnaise, Romano cheese and Worcestershire sauce into Swiss chard mixture and cook 10 to 15 minutes, stirring occasionally, until dip is hot and thick. Add salt and pepper to taste. Serve warm, garnished with plenty of chopped scallions or chives, if desired. Can't survive on leafy greens alone? You'll find links to all my sweet and savory Less Fuss, More Flavor recipes in the Farmgirl Fare Recipe Index. © FarmgirlFare.com, the chard crazy foodie farm blog where Farmgirl Susan shares stories & photos of her crazy country life on 240 remote Missouri acres. It's October?! What the heck happened to September? While there isn't often a whole lot of excitement in the garden in October (unless you count my jumping for joy that the majority of damaging insects have finally disappeared), it's my favorite month on the farm. Autumn doesn't last long in southern Missouri, but when it's here it's very comfortable and very beautiful. In a good year, the colors of the turning leaves rival those in New England. No, really. The doors and windows of The Shack still stand wide open, and it cools down pleasantly at night, though not enough to warrant having to start up the woodstove yet. That means we aren't hauling firewood into the living room half a dozen times a day, although we do need to start cutting some. This year's woodpile (which is our main source of heat throughout winter) is pretty much non-existent. Okay, there's no pretty much about it, it's non-existent. Months of sweltering heat and humidity make it incredibly easy to ignore that fact--every single year. Since I haven't been busy dealing with firewood, I did have a chance to plant some fall crops. The seedlings you see above were direct seeded on September 15th, and I guess I was a little heavy handed with the sprinkling. They're in dire need of thinning, but too much germination is always better than not enough. And the cute baby sprouts will be tasty and nutritious additions to the salad bowl. I planted these seeds in the taller of the two mini greenhouse beds, so once it starts freezing at night I'll cover the frame with thick clear plastic. (Note: there's construction information for the mini greenhouse beds in the comments section of that link. And for those of you who have been asking about what the layout of my garden looks like, you can see most of it in the photos, though it's been expanded since then.) Since I planted only crops that thrive in cool weather in there, I'm hoping to extend my harvest well into winter. I've had pretty good luck growing turnips over the years. You can read more about my experiences here, including growing tips and how to harvest from your turnip plants all year long. One of my favorite ways to use turnips is in Garlic Lover's White Bean Soup, a tasty, easy, and oh-so-comforting recipe. It also happens to be vegan and fat free, but you don't have to tell anybody those details unless you want to. I started plenty of other seeds as well, including several types of Oriental greens, though not everything I'd hoped to. Five raised beds and not a single lettuce seed sown anywhere! I'm telling myself there's still time, but at the rate time has been speeding by, I'm going to blink and it'll be Christmas. Lettuce seeds started or not, I can only hope that my beloved October will stick around long enough for me to enjoy it. Looking for lettuce growing tips? You'll find even more in my post, Lettuce and Arugula in the Garden, with Step-by-Step Photos Showing How To Grow Arugula from Seed in Less than a Month. Happy growing! I don't think about salad the same way normal people do. I've even started eating it for breakfast. You can read more about this obsession on my food and farm blog, Farmgirl Fare, in a post called On Loving Lettuce. Lettuce was one of the few things I managed to plant on time this year, and am I glad I did. It's an iffy spring crop in southern Missouri. We usually have at least a few days in the 90s in April—which in itself can be enough to ruin your crop—and it's always a toss up as to whether May will behave itself and stay mild or jump headfirst into summer. This year it behaved, and I harvested gorgeous lettuce every day for weeks. Today I enjoyed the last of my stash in the fridge, and my salads will now be lettuceless at least until early fall. But if you live in a place where summers are mild (oh how I envy you! ), it's not too late to plant, and growing your own lettuce from seed is easier than you might think. You can tuck a little lettuce almost anywhere, even in spots that are mostly shaded. The only pests that touch the lettuce in my organic kitchen garden are ravaging rabbits. If slugs or snails are a problem in your area, a sprinkling of diatomaceous earth on and around the plants should take care of them. Diatomaceous earth is an all-natural pesticide made of finely ground fossils of prehistoric freshwater diatoms and can be used indoors and out to kill all kinds of creeping and crawling insects. We buy food grade diatomaceous earth in 50-pound bags and feed it to our livestock (and even the dogs) as a natural wormer. Don’t have a 'real' garden? Lettuce will happily grow in containers, and since it doesn’t require two feet of soil depth, something short and wide is ideal, such as a plastic dish tub or one of the large plastic bus tubs restaurants use to hold dirty dishes. For years my lettuce planting schedule went like this: start numerous little flats of seeds in mid-winter, only get around to transplanting a small fraction of the tiny seedlings into individual plugs, then only get around to transplanting a small fraction of those into the garden. I now take a much lazier approach—and end up with a much bigger harvest. Simply scatter your seeds onto some nice dirt (compost and manure are excellent soil amendments), then sprinkle them with a light layer of soil or compost, barely covering them. Water well, then sit back and wait, daydreaming of the beautiful bounty you are bringing to life. You can begin harvesting after only a few weeks—just snip what you need with scissors and leave the plants to continue growing. What I've started doing is sowing the seeds very thickly (which virtually eliminates weeds), then as soon as the plants have a few bite-sized leaves I start to thin them out. And I just keep thinning. I reach in, pluck out a few of the crowded plants from several different spots, and I swear by the next day the remaining plants have already taken over the empty spaces. You can see in this photo how big the plants with more space have already become. One of the best things about growing lettuce from seed is that there are dozens of varieties available. While the phrase 'picture pefect' rarely applies to my garden unless I’m daydreaming, I did do some aesthetically pleasing, taste-test planting this year. I divided a 4' x 8' raised bed into eight squares and planted a different type of heat tolerant, slow-to-bolt lettuce in each. I separated the squares with rows of French Breakfast and Easter Egg radishes, which are easy to grow and ready in under a month—just be sure to thin the young seedlings so the rest will have enough room to mature. Apart from the Red Deer's Tongue, a loose head bib type variety believed to have originated in the mid 16th century, that was a no-show, my experiment was an eye-pleasing, tasty success. The other varieties I planted were Buttercrunch, which I adore; Gentilina, an Italian variety with bright green, frizzled, leafy heads; Jericho, a crisp, sweet cos type bred for the deserts of Israel and pictured at the top of this post; New Red Fire, which has deep red frilly leaves and is extremely slow to bolt; Merveille de Quatre Saisons, a reddish green bibb type; Tom Thumb, which produces a 6" to 7" dark green butterhead in 47 days; and Winter Density, a compact 8" Romaine with thick dark green leaves full of flavor. Can’t make up your mind which kind of lettuce to plant? Packets of salad mixes are the way to go. I’ve been growing the Rocky Top Lettuce Blend from Baker Creek Heirloom Seeds for years. Pictured here is a 4' x 8' raised bed of Baker Creek’s European Mesclun Mix I planted in late March that went gangbusters (the closeup photo further up is of this same bed). 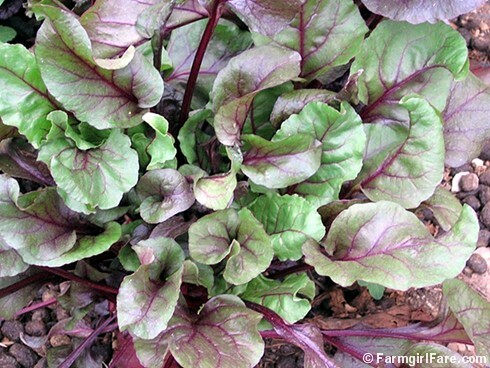 The Baker Creek catalog says this colorful mix, which includes lettuce, radicchio, arugula, endive, orach, mizuna, kale, mustard, and corn salad, is a favorite with market growers and has flavors that range from sweet-mild to sour-hot-tangy. Talk about some truly gorgeous salads. Another easy to grow from seed heirloom variety of lettuce I like is Freckles, which you can read more about here. The main thing to remember when growing lettuce is that heat is its bitter enemy— literally. Even a few days in the upper 80s or 90s can have your whole crop tasting terrible. This is very, very depressing. A partly shaded garden spot is best. The next best thing is to create some comfortable shade for your plants. If the thermometer reads 90 degrees in the shade, it'll feel a whole lot hotter than if you're standing in the sun for eight hours. You can learn more about how I create garden shade in Gardening on the Cheap: How To Quickly and Easily Shade Lettuce and Other Plants and Why You Should. If you’re growing in containers, you can move them in and out of the sun. Put large, heavy pots on wheeled bases for effortless rearranging—a trick I learned from my friend Cookiecrumb, who successfully grows containers of tomatoes on a small condo patio by rolling them into the sun. On the other end of the thermometer, lettuce is quite cold hardy and can survive light frosts. I’ve had uncovered lettuce subjected to 24 degrees, and it thawed out just fine once the sun hit it. Floating row cover is wonderful stuff that will give you about 5 degrees of protection, while still allowing light and rain to penetrate. If you treat it well, it can last for years. An old bedsheet draped over your plants is another easy way to protect them. So what are you waiting for? Sow some seeds today, and you’ll be harvesting glorious green bounty in less than a month. Just make sure you plant enough—I’m sure I can’t be the only lettuce overeater out there. —The Vegetable Gardener’s Bible, 10th Anniversary Edition by Ed Smith. This has been my favorite gardening book for the past 7 11 years, and I highly recommend it for kitchen gardeners of all levels, especially beginners. It's full of wonderful tips and is always the first book I turn to when I have a garden question. —Baker Creek Heirloom Seeds, a wonderful family owned company located here in Missouri, sells over two dozen varieties of lettuce in packets of 700 seeds for $1.25 to $1.50 each. Salad blend packets contain 1,200 seeds and cost $2.50. I’ve been buying seeds from them for years. They offer over 1,000 types of non-hybrid, non-GMO, non-treated, non-patented and often very rare seeds from all over the world. —Pinetree Garden Seeds in Maine is another company I’ve been ordering from for years. They specialize in smaller packets of seeds for the backyard gardener and offer many varieties of lettuce seeds, including a few of their own special mixes. Packets of 500 seeds sell for just 65 to 95 cents each. They also sell all kinds of reasonably priced garden & kitchen tools and gadgets. © 2007 FarmgirlFare.com, the dirty handed foodie farm blog where Farmgirl Susan shares photos & stories of her crazy country life on 240 remote Missouri acres. I need to put up something here--anything. Even if it is just a picture of a couple of little radish flowers. I have no idea how it got to be the first day of summer already. It seems like just last week I was covering up plants in the greenhouse and fretting about that nasty hard freeze in April. Okay, maybe not last week. If you're feeling overwhelmed by the flurry of passing time--and unflurry of activity in your garden--know that you're not alone. I started InMyKitchenGarden.com in March 2006 as a personal online gardening journal, a sort of side dish to Farmgirl Fare, my food and farm blog, that would hopefully help me keep better track of my efforts in the garden. Last year was a definite success. It's wonderful to be able to look back at all the growings-on, especially since I have to admit I've already forgotten many of the details. I'm also a little in awe. How in the world did I have time to not only do so much in the garden, but document it all as well? Lambing Season 2007, my biggest and busiest yet, had something to do with it I know, but that excuse only lasts so long. And it ended quite a while ago. Nearly every day I've taken photos of the garden, had all sorts of realizations, and written up dozens of blog posts in my head. But they must have been rootbound because none of them ever made it as far as my typing fingers. I consider myself incredibly behind in the garden this year (I actually bought tomato and pepper plants for the first time since I've lived in the country! ), but at the same time, a lot has been happening. In early March I seeded an entire 4' x 8' raised bed with spinach and had my best crop ever, harvesting scrumptious baby leaves for at least a month and a half. I spent weeks and weeks picking all sorts of gorgeous lettuces that had so much flavor I often found myself shaking my head in disbelief. I grew two types of radishes, ate my fill sliced in salads, then waited until there was enough to use in a recipe for braised radishes a Farmgirl Fare reader had suggested, prepped the harvest, and promptly forgot about it in the refrigerator--then learned that even baby chicks will turn up their beaks at aged radishes. I put in a new strawberry bed. I foolishly planted seeds of my two of my favorite varieties of skinny little bush beans in late March, Straight'N'Narrow and Masai, which all sprouted (something that rarely happens for one reason or another) and then all promptly froze to death, despite my covering them with floating row covers and old bedsheets. I just got around to re-planting both types of beans this past week. I did, and am still doing, a lot of bizarre experimenting, mostly due to running late and laziness. I succeeded in having Swiss chard either ready to pick or in the fridge ready to be eaten almost every single day of last fall, winter, and spring. I totally forgot to start any basil seeds. I stopped long enough to notice just how pretty tiny radish flowers are. I finally put up something on my long neglected garden blog. It should only get easier from here. Happy first day of summer. And a big hello to all the new readers and e-mail subscribers. --How to grow your own gourmet lettuce--it's easier than you might think! --How to grow Swiss chard from seed & why you should, plus two original Swiss chard recipes I'm now addicted to. --More regularly scheduled posts--I hope. Last spring I experimented and sowed baby beet seeds between rows of onions. February 2012 Update: You'll find more about growing beets in this new post, Garden Journal 2/25/12: Sorting Through My Seed Stash, Beet Growing Tips, and Planting by the Moon. I have no idea why I first started growing beets, since I had never eaten one in my life. The only time I had come face to face with any was during childhood, when scary looking, reddish-purple discs would sometimes appear on restaurant salads. Fortunately my mother was quick to reach over and stab the offending things with her fork, always murmuring "I love beets!" as she popped them into her mouth. Even if you don't like beets (those scary canned specimens don't count), you should still sow a few rows of beet seeds in your garden this year. Why? Well, just look at this photo of Bull's Blood beet 'greens' overwintered last year in my barely heated Zone 5 homemade greenhouse. Has there been anything so beautiful gracing your salad plate lately? I didn't think so. Beets are not only very easy to grow but are also extremely good for you. Beets from the garden are like nothing you will find in the supermarket produce aisle. And while I have been known to devour an embarrassingly large plate of Caramelized Beets & Garlic (the only way I ever cook beets), I mainly grow beets for their greens. Bull's Blood is one of my favorite varieties to grow. Its roots are sweet and tasty, especially when small, and they have lovely pink rings inside. But I recently learned that this popular heirloom is actually grown primarily for its baby leaves, which are ready in as little as 35 days and are, according to my Baker's Creek Heirloom Seeds catalog, "all the rage in salads." The folks at High Mowing Organic Seeds claim that they're organic gardening pioneer "Eliot Coleman's choice for a red leaf in winter harvest salad mixes." I had no idea I was so chic. Beets come in all kinds of shapes, sizes, and even colors. Along with my beloved Bull's Blood, this year I'm growing several different other types, including three new-to-me heirlooms: Golden, Chioggia, and Flat of Egypt. Not quite ready to grow your own beets? (Why on earth not?) You can often find interesting varieties of beets at farmers' markets. 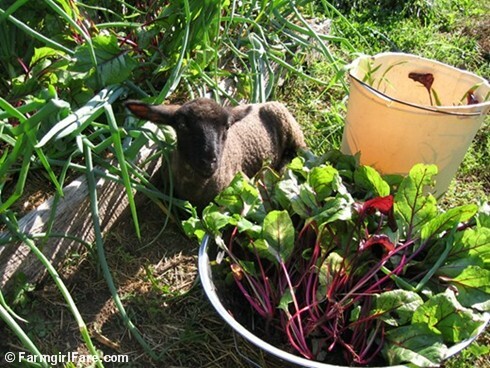 Direct seeding in the garden is the easiest way to grow beets. They can be grown in most types of soil but prefer that it be deep, well-drained, and includes plenty of organic material, such as compost or aged manure. Too much nitrogen will cause beets to produce lots of greens but little roots. Soak beet seeds in water for 24 hours before planting to aid germination. Beets prefer cool weather. For an early summer crop, sow seeds in a sunny spot, 3 to 4 weeks before your last frost. Plant seeds 1/2-inch deep, 2 inches apart if growing for greens, 3 to 4 inches apart if growing for the roots (but you can still harvest the greens, too). Sow seeds again in late summer for a fall crop. In frost free areas, you can do a third planting in September for a February harvest. If you prefer a smaller, continuous harvest instead of one big one (and if you're more organized than I am), sow some of your seeds every two weeks instead of all at once. If you're minding the moon signs, sow beet seeds in the third quarter, under the signs of Cancer, Scorpio, Pisces, Libra, and Capricorn. I plant by the moon as best I can because I need all the help I can get. Astrological Gardening The Ancient Wisdom of Successful Planting & Harvesting by the Stars by Louise Riotte is a great book on the subject. Good companions for beets: bush beans, the cabbage family, corn, leeks, lettuce, lima beans, onions, and radishes. Bad companions: mustard and pole beans. Want to learn more about using the natural benefits of plants to protect and support each other? Louise Riotte's Carrots Love Tomatoes: Secrets of Companion Planting for Successful Gardening is a classic guide with over 500,000 copies in print. Each beet 'seed' is actually a dried fruit made up of 2 to 6 individual seeds, so seedlings will sprout very close together. Everything in this photo came from one seed cluster. If you plan to harvest the beet roots as well as the greens, thin the seedlings when they're about 2" high, choosing the best looking one in each cluster. Use scissors to snip the seedlings at soil level so as not to disturb the remaining plant. Be sure to toss the tender young leaves into salads. Thinning beets with Baby Cary back in 2006. When growing beets for greens, you can thin the plants over time as they grow larger, as pictured above, giving you a bigger harvest. The weedy raised beet bed supplies goodies for the chickens, me, and the compost bin. Beets require even moisture, so don't let the soil dry out. Mulch will help keep the soil moist and the beets cool, as well as discourage weeds; I like to use grass clippings. I also sprinkle compost over the newly planted seeds and around the sprouted plants. You can sow your beets next to taller companion plants that will shade the soil, but be sure you don't end up blocking out all the sun (been there, done that). A tiny but tasty beet harvest. One of the best things about homegrown beets is that even if you abuse them, they will still taste delicious. The hardy plants will put up with frosty mornings as well as hot and humid summer days. The beets you see here were planted late and thinned too late. They were also left in the ground until July 31st, so some of them ended up much too big—and looking a little strange. I then stuffed my poor harvest in a plastic bag and stashed it in the refrigerator for two months because I wanted to save it for my mother's upcoming visit. I was sure the beets would be tough and woody (not to mention half rotten), but I should have known better—beets from the garden do not hold a grudge. They were wonderful. Recommended Reading: The Vegetable Gardener's Bible by Ed Smith. This has been my favorite gardening book since it was published in 2000, and I highly recommend it for kitchen gardeners of all levels. © FarmgirlFare.com, the sprouting foodie farm blog where you know the beet goes on.